When you embed a dashboard, the following error is shown: “There was a problem displaying this chart” and “Requests to the server were blocked by an extension”. 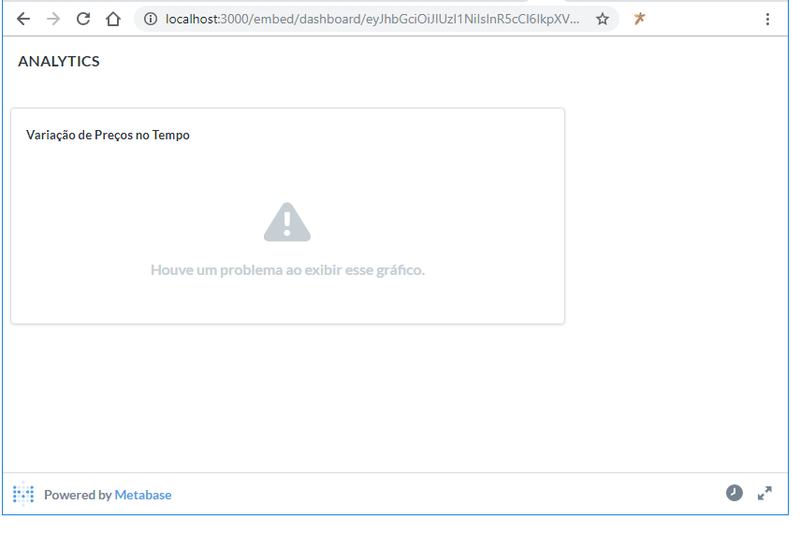 When using a public link, dashboards are displayed normally, but when embedding, this error appears. Did any of you ever face this problem and found a solution? I’m not sure what’s happening, but I would guess it has something to do with permissions. What type is the question - custom, nested, native? Does the same thing happen if you try to embed just the question? Yes, this is happening with the panels and also with the individual questions. And as for the type of question, it can be any of the types: Custom, nested or native. Do you see anything in the Metabase log or browser console? Can you provide steps to reproduce? I have not been able to reproduce this, so I need more information. I have updated my browsers and it seems to have solved the problem. See the dashboard in this post When did the update happen?. Many thanks huh. This community of Metabase here is very active and supportive.